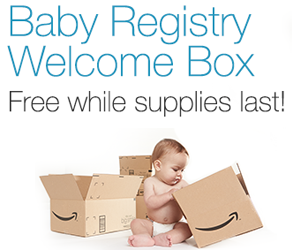 To get a FREE Baby Registry Welcome Box from Amazon sign up for Amazon Prime if you’re not a member (don’t forget to cancel within 30 days). Create a baby registry here, then add items according to the Jumpstart guide here for each category add 15 items to your registry to be eligible! (make sure each check mark turns green). Once you’ve completed that, click the claim button on the left side of this page here, checkout and the order total will be FREE! Baby Registry Welcome Box FAQ: Q: How do I become eligible to get a Welcome Box? A: Select Prime customers who use Jumpstart to create an Amazon Baby Registry. Only while supplies last. Q: Once I am eligible, how can I get a Welcome Box? A: Once you are eligible, you will see a “Claim Now” button on the left side of your Amazon Baby Registry. Click the button to automatically add the Welcome Box to your cart. You will also receive an email to the address associated with your Amazon.com account in 1-2 days. This will include instructions on how to redeem the offer. Note that this is a limited time offer, good while supplies last. Only eligible customers, logged into their Amazon.com account, will be able to redeem the offer. Q: What products will be included in the Welcome Box? A: It’s a surprise! The box will include a selection of products for both baby and parents. Q: Do I need to add an item from each category to complete a registry? A: Within any category of Jumpstart you can select “Mark as complete”. This will indicate that you have no need for this item in your baby registry. Once you have either added an item from each category or marked them complete, you will satisfy this requirement to receive a Welcome Box. You can Also Follow Us On Facebook, Twitter, Pinterest and Google+ for 24 hour freebie updates and more!